Ibis I features a fuchsia bird with washes of light blue and gray ink covering much of the background. Ibises were revered by the ancient Egyptians, and as symbols of the god Toth, they were often mummified. The artist realistically depicted the bird's head, neck, feet, and wings, which are slightly raised as if it is about to take flight. Where the bird's body would normally be is an orange heart—a symbolic shape that also appears in several other works by the artist. 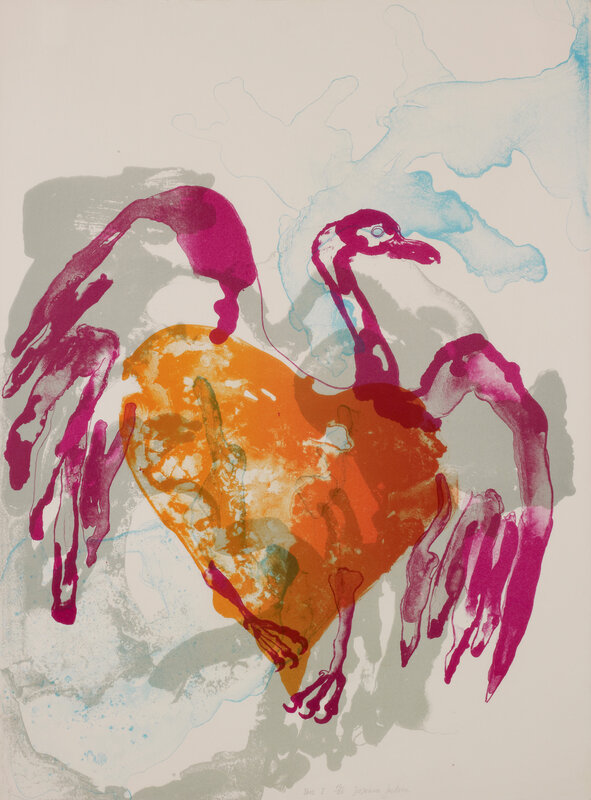 Jackson created this four-color lithograph while in residence at the Normal Editions Workshop at the Center for the Visual Arts at Illinois State University in 1977. "Ibis I." Now Dig This! Art in Black Los Angeles, 1960–1980 Digital Archive. Los Angeles: Hammer Museum, 2016. https://hammer.ucla.edu/now-dig-this/art/ibis-i.